Last year I posted an episode that outlined an idea for sending someone you care about into the next season of life. Often that is graduation from some type of schooling, which is why I am posting it again this time of year. I can’t recommend this practice enough. Not only is it a positive experience for the person receiving the blessing, but everyone involved is enriched. Launching the graduate is a responsibility we should take as the further generation to poor back into the ones coming after us. It should be more than gift cards and cake with punch. But how do we make the milestone more meaningful? How do we help launch this generation into the next season God has planned for them? That’s what we talk about, offering ideas and bringing experience to the table in the repost episode of the She Yearns Podcast, Launching the Graduate. You can now check out the Re-post Launching the Graduate from iTunes, GooglePlay, Stitcher, or SoundCloud. Just click on the links below! As always, you can scroll down and listen right here! Graduation season is upon us. 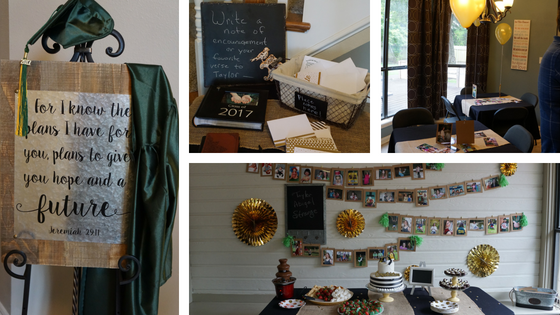 And if you are looking for something more than a card with money to send the graduate; or a party with cake and punch to celebrate the milestone–something that would be a blessing–you are in good company. We were wanting to do something more meaningful for our graduate. Something that would mark the end of an era while ushering in the next thing God had in store for her. Thanks to those who walk these roads before us, I had a friend who did exactly what I had in my heart to do. You can call it many things, but I’m calling it a Launch party with a Blessing. 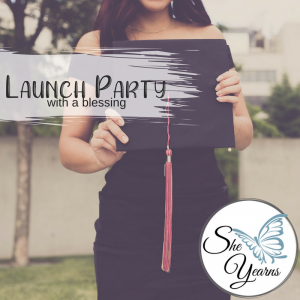 If you hop on over to the She Yearns Podcasts, you can listen to how I came upon the idea, how to orchestrate your own event like it, and the tips I have to offer from a mom’s perspective. That episode is called, Launching the Graduate. What I wanted to bring here in addition to the podcast are some of the images that were taken at the Launch Party held for our graduate last year. A huge Thank You goes to Tim Flanagan for taking the photos, and Cherie, his lovely wife, for suggesting he did. (Note they also are responsible for all the photography on the website, if I am pictured.) I am grateful for their incredible abilities and giving spirits to step up and do this for us while they were just guests! Most of the personal ugly cry ones and those featuring my family are on my private pages. But these should give you a taste of the simple environment. It’s just folding tables, card stock and thumbtacks! Remember, the moving truck was coming in a few hours. You can do this! Again, I highly encourage you to take these ideas and do something eternally significant for your graduate. Please poor godly wisdom into their lives. And take every opportunity speak blessing over the next thing God has for their lives.